The brackets and wires on traditional metal braces create hard to reach places where harmful bacteria can thrive. If brace wearers don’t pay continual and careful attention to oral hygiene, their teeth can be permanently damaged. The cycle of decay goes like this: 1. Food particles are trapped in the tiny spaces in and around the wires. 2. The bacteria in the food particles multiply. 3. The bacteria creates plaque. 4. The plaque erodes the enamel. 5. Cavities form. Teeth are not the only thing at risk here, Phoenix orthodontic patients can also develop gum disease (gingivitis) which can progress quickly into periodontitis and eventual bone recession and tooth loss. Bottom line: orthodontic patients need to be vigilant about a healthy diet and effective oral hygiene. Most Harris Dental brace wearers know that they should avoid sticky, sugary foods that stick to their braces, but some don’t realize that any carbohydrate-based food turns into sugar. Thus, a cracker can be just as bad for your teeth as a Tootsie Roll if the particles are not removed. Brace wearers should also watch their intake of highly-acidic foods and beverages. Though some acidic foods are very healthy – think tomatoes, oranges, raspberries – it is wise to substitute less acidic foods that contain similar nutrients. There are few beverages as harmful as soda and sports drinks, both of which have the detrimental duo of acid and sugar. 1. If your orthodontist has fitted you with elastics, remove them before brushing. 2. Using a fluoride toothpaste and a soft, compact toothbrush, place your brush at an angle of 45 degrees against the gums. Gently brush along the gum line where the gums and teeth meet, using a small circular motion on each tooth. 3. Spend about 10 seconds on each tooth before moving onto the next tooth, brushing in a set pattern so that you don’t miss any teeth. 4. Gently brush the braces. Press your toothbrush firmly enough so that the bristles spread into the gaps between the wire and the tooth. Brush in and around all of the brackets and wires. Ensure that you brush under the wires. A battery powered brush may be helpful. 5. Brush both the inside and the outside surfaces of your teeth using a gentle circular motion on each tooth. Brush the inside and the outside surfaces of your teeth. 6. For the chewing surfaces, use a firm back and forth motion. 7. Spit out excess paste, then closely inspect your teeth and braces in the mirror to check that they are clean and shiny. 8. Replace your elastics in accordance with your orthodontist’s recommendation. 9. After brushing, rinse with a fluoride mouthwash for 1 minute to help prevent cavities and white spots. 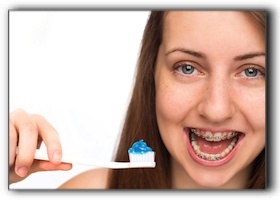 It is also important to floss while wearing braces, but that is a topic for another article. Harris Dental provides quality general and cosmetic dentistry including sedation dentistry, dental implants, and Invisalign clear braces. Our personable team is devoted to oral health and stunning smiles. If you are new to the Phoenix area, we invite you to call us at 480-428-0040 to schedule an exam and cleaning. Our team looks forward to meeting you.